Exhibition stand design is one of the simpler ways to stand out from the potentially hundreds of similar businesses at the event. A good design will get your brand noticed – and in turn, generate you more sales leads. Stand design doesn’t just mean the actual artwork that you use, whilst that is a big part of it, stand design also encompasses the layout of your exhibition stand and the interactivity. This idea depends a lot on the space you have available to work with – the bigger the floor space the better. Instead of simply having a back wall, make better use of the floor space you have available. Why not create a centre piece that customers can walk all the way around? One of the best ways to create a centrepiece like this, is to utilise Twist banners. Twist banners can link together allowing for the flexibility to bend around corners. Three, or four banners with Flexi-link kits can be formed into a triangular or square shape which would make a fantastic centrepiece for your exhibition stand. The best part about using Twist banners – you aren’t stuck to using that layout for all of your future events. You have complete control of how the banners are laid out. For example you can use them as singular banners, or maybe add more Twist banners and create different rooms on your exhibition stand. The possibilities are endless. Another way to add a third dimension to your stand is fabric high-level branding. These massive structures are lightweight and are anchored to the ceiling of the exhibition hall, designed to hang just above your exhibition space. The fabric graphics are fully printed, allowing you to create a vibrant hanging display that is sure to catch the attention of attendees from across the hall. When planning your exhibition stand we can create a fully 3D render of your ideas so you can see what it’ll look like when it’s set up – before you’ve even ordered. Improving your lighting is perhaps the simplest way to improve the design of your exhibition stand and create a more appealing environment for attendees. Many stand solutions such as Pop Ups, Twist and Centro have specific LED lighting that can be attached to the top to give more light and to accentuate the appearance of your artwork. However, artwork lighting isn’t your only option. If you have products on display then careful light positioning can improve the appearance of the products you are offering, as well as drawing attendee’s attention to the product. Use of eye-catching colours are a must when designing your exhibition stand. If you have a colourful logo and company branding, using similar colours can boost brand awareness. However “eye-catching” colours doesn’t necessarily mean, throw every colour you can think of on to the design – colours need to be thought out and added for a reason. Using too many colours can make text hard to read or can simply turn away potential visitors to your stand. Don’t feel like you have to stick with just colours either. Displays with large format photos can be just as engaging, if not more so. Just make sure they are of a high resolution, taken by a professional and are relevant in some way to the reason you are exhibiting. While it may not be the first thing you think of when designing an exhibition stand – furniture and technology are definitely a big part of design. When considering technology, such as iPad stands or monitor brackets, think about what position they should be in to provide you with the most benefit. It’s also important to consider what’s going to be featured on your technological devices. If you want people to be able to browse through your website, we have an excellent article on how to lock your iPad to a specific webpage. If you have a large monitor you could feature a looping, promotional video for your product – just make sure it’s professional, informative and entertaining. Another good idea if you are big users of social media, is to have a live feed of tweets that exhibition attendees can send you via a specific hashtag (#) you have selected. On your exhibition stand, less is usually more when it comes to text – so long as you aren’t missing out important information. Exhibitions are fast-moving places and people usually won’t take the time to stop and read a paragraph of text on your exhibition stand wall. Instead, keep it short, sweet and informative. The fonts you use should be in line with your corporate branding, your company will often have a set font that they use throughout their marketing materials. If not, then a font that is large and clear enough to be seen from a distance is a must. Text should also be positioned towards the top of your artwork, so it isn’t blocked as people move around your stand. We hope our exhibition design tips help you to create an exhibition stand that wows your attendees and makes you stand out from your competitors. 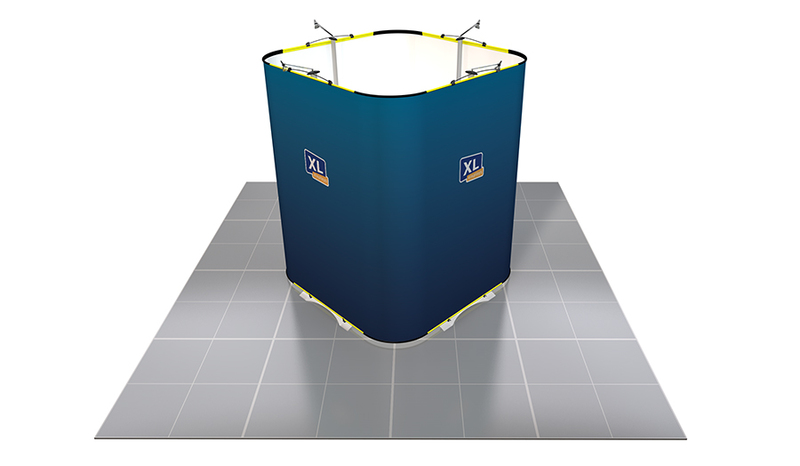 At XL Display we are experts in exhibition stand design and offer a wide range of display equipment, from portable displays, such as pop up display stands, to bespoke exhibition stands. For more information on our product range or graphic design service, please contact us or call us on 01733 511030.